Coburg is a suburb of Melbourne, Victoria, Australia, 9 km north of Melbourne's central business district. 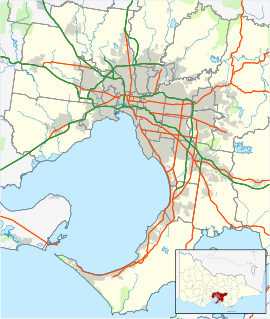 Its local government area is the City of Moreland, although a handful of properties on Coburg's eastern boundary are located in the City of Darebin. At the 2016 Census, Coburg had a population of 26,185. Coburg's boundaries are Gaffney Street and Murray Road in the north, Elizabeth Street and Merri Creek in the east, Moreland Road in the South and Melville Road, Devon Avenue, Sussex Street and West Street in the west. Coburg is designated one of 26 Principal Activity Centres in the Melbourne 2030 Metropolitan Strategy. In the 2016 Census, there were 26,185 people in Coburg. 62.1% of people were born in Australia. The next most common countries of birth were Italy 5.7%, Greece 2.8%, Lebanon 2.4%, England 2.2% and Nepal 1.8%. 58.3% of people spoke only English at home. Other languages spoken at home included Italian 9.1%, Greek 6.3%, Arabic 5.7%, Mandarin 2.0% and Nepali 1.9%. The most common responses for religion in Coburg were No Religion 36.7%, Catholic 26.7% and Eastern Orthodox 8.5%. The cultural diversity of Coburg is reflected in many ways - through its local street and music festivals, variety of cafes, bakeries, restaurants and grocery shops stocking ingredients from around the world. Pubs in Coburg - The Post Office Hotel, The Woodlands Hotel, Browns Corner Hotel and Drums Hotel. Cafes in Coburg - The Eastern Bloc, True North, The Glass Den, Little Dear Tracks, The Boot Factory, Two Monks Cafe, Wild Timor Coffee, Al Alamy, 8th Nerve and Half Moon Cafe. Prior to European settlement, the area around Coburg and Merri Creek was occupied by the Woiwurrung speaking Wurundjeri people of the Kulin Nation. The Wurundjeri had a religious relationship to their land, participating in corroborees and sacred ceremonies on Merri Creek. Coburg was first surveyed by Robert Hoddle in 1837 - 1838, and he recorded that a Mr Hyatt had a sheep station and hut on the east bank of the Merri Creek, near present Outlook Road. Hoddle marked out a 327-acre (1.3 km²) village reserve with two roads for the district: Bell Street West and Pentridge Road, later called Sydney Road. In 1840 the place was named Pentridge by a surveyor called Henry Foot who lived and worked near Merri Creek. It was named after the birthplace of Foot's wife: Pentridge, Dorset, England. Dr Farquhar McCrae, a wealthy surgeon, purchased 600 acres (2.4 km²) in the area which he called Moreland. In 1841 he also bought land called 'La Rose' in what is now known as Pascoe Vale South. The house he built in 1842 or 1843 is now known as Wentworth House, and is the oldest known private dwelling in Victoria still standing on its original site and the fifth oldest building in Victoria. In 1842 the first inn, The Golden Fleece, was built on Sydney Road just north of Page Street. Twenty one farms were in the area by 1849. With the Victorian gold rush in the 1850s the population of the area grew rapidly. In 1858 water mains from Yan Yean were connected and the first local paper, the Brunswick and Pentridge Press, was started. In 1859 the Pentridge District Road Board was formed to get roads built in the area, the start of local government for the area. Quarrying of bluestone began in the area 1850s, and by 1875 there were 41 quarries in Coburg. In December 1850 16 prisoners were moved from an overcrowded Melbourne Gaol to a stockade at Pentridge. Prisoners at what came to be called HM Prison Pentridge were immediately put on "hard labour" by breaking up bluestone for road surfaces. In 1867 a public meeting was called to change the name of the district, as residents were stigmatised and embarrassed at living in a suburb principally known for its gaol, Pentridge Prison. Robert Mailer of Glencairn suggested that the suburb name be changed to Coburg, inspired by the impending visit to the colony of the Duke of Edinburgh, who was a member of the royal house of Saxe-Coburg and Gotha. The government agreed with the proposal and the change was made in March 1870. The Post Office opened on 1 August 1853 and was renamed Coburg in January 1870. Sydney Road attracted numerous hotels and commercial premises in the 1860s. Friendly societies soon formed: Manchester Unity (1863), Druids (1867), Rechabites (1868) and a St. Patrick's Society in (1870). Coburg later became a Shire in 1875. The Upfield railway line opened in 1884, and the Coburg railway station was built in 1888. In February 1889 the horse tram service began along Sydney Road. Electric trams started in service in 1916. By 1899 there were 6000 people in the district. Coburg was gazetted as a borough in 1905 with Thomas Greenwood becoming Coburg's first mayor. The Public Hall built in 1869 was extended in 1909, but was still inadequate for the growing city. The new Town Hall was built and opened in 1923, with further extensions in 1928. Lake Reserve is a popular picnic spot on the Merri Creek. The land was purchased in 1912 and a weir was constructed in 1915 to form a lake contained by basaltic outcroppings. The reserve was immensely popular, with diving boards, wading pools, kiosk and gardens, and continues to be a favourite picnic spot, also accessed by the Merri Creek Trail. After World War I there was significant development east of Sydney Road, with the former East Coburg Primary School opening in 1926, and a Coburg East Post Office opening in 1929 (closing in 1975). A Coburg West Post Office opened in 1936 and closed in 1979. Coburg High School, now demolished, stood opposite the Coburg Town Hall, and was once one of the few selective co-edhigh schools in Melbourne and was also highly regarded. In June 1994 the 72-year-old City of Coburg ceased to exist when it merged with the City of Brunswick to become the new City of Moreland. The main commercial activity in Coburg is the precinct between Coburg railway station and Sydney Road. Coburg doesn't have an enclosed shopping mall, though it does have four shopping arcades on the west side of Sydney Road. Coburg's main commercial precinct comprises about 250 shops, a small indoor market, several supermarkets and discount stores such as Dimmeys arranged around large, ground level car parks. In the 1990s the Victoria Street pedestrian mall was revamped with native trees and bluestone paving and has become an extremely popular place for locals to congregate, enjoying the local cafes. While Coburg Shopping Centre is very busy during the day, its modest number of restaurants, cafes and bars means that it can be quiet in the evenings. The commercial strip of Sydney Road is continuous from Coburg's southern neighbour Brunswick, but it has a very different character, having so far remained ungentrified. Three tram lines service the area. Route 19 travels along Sydney Road from the terminus at Bakers Road, North Coburg to Flinders Street station in the city. While the scheduled service is 6–15 minutes apart it is frequently late due traffic congestion on Sydney Road. Route 1 tram service travels from the terminus at Bell Street, Coburg, along Nicholson Street, then Lygon Street Brunswick East, Swanston Street past Flinders Street station to South Melbourne, while route 6 travels from the tram depot on Moreland Road, joining the number 1 route at the intersection of Moreland Road and Nicholson Street. While the number 1 turns to South Melbourne at the Arts Centre, route 6 continues along St Kilda Road to Glen Iris. Route 58 from Toorak serves the western part of Coburg via Melville Road, terminating at Bell Street. Cyclists have access to many on-road bike lanes as well as the Upfield Bike Path and the Merri Creek Trail. There are also several bus routes and they all serve either the north west or the north of Coburg. Route 527 is a very popular service as it serves Preston which is an attraction for food and retail outlets in the north and is only a short 10-15 minute bus trip from Bell Street near Sydney Road. Coburg has a variety of primary and secondary educational facilities. There is a special developmental school, four government primary schools (Coburg North PS, Coburg PS, Coburg West PS, Moreland PS), three Catholic primary schools and a Maronite Christian primary school. Australian International Academy (previously known as King Khalid Islamic College) is a private Islamic school providing primary and secondary education. Following a sustained local campaign, Coburg High School was reestablished in 2015 catering for years 7 to 12. There are other schools including the Antonine College secondary school campus (7-12), and Mercy College for girls. The suburb is home to the Coburg Lions Australian rules football club in the Victorian Football League; the suburb also is home to 2 Essendon District Football League clubs - West Coburg FC and Northern Saints FC. Coburg also has basketball, cricket, tennis, baseball, swimming, table tennis, track cycling and soccer clubs. One of the oldest sporting clubs in the area is the Coburg Harriers Athletic Club which has been established for over 100 years. Major features of the area include the Sydney Road commercial area, the Moreland City Council civic centre precinct on Bell Street including the Coburg City Hall, La Rose house (Victoria's oldest known private dwelling), the John Fawkner Hospital on Moreland Road, and Lake Reserve on Merri Creek. The suburb's most famous landmark is HM Prison Pentridge, which has recently been redeveloped into a housing estate. Land prices have risen considerably since 2001, with The Grove long regarded the most prestigious street in the suburb. Coburg also has a number of places protected by Heritage Overlay controls in the Moreland planning scheme. Herbert Nelson Davis (1899-1963). Born 21 April 1899 in Coburg, Victoria. He was the sixth child of William Bulmer Davis and his wife Letita Ellen. Attended St. Paul's Cathedral school. Davis was famous for his work in the music field as an organist, choirmaster and conductor. Bruce White (1916-1984). Born 3 November 1916 in Coburg, Victoria. He was the second child of his father Bruce Hellyar White and his wife Blanche Mabel. Attended St. Kevin's College. White enlisted, in 1942, in the Royal Air Force, qualifying as a navigator. ^ a b Australian Bureau of Statistics (27 June 2017). "Coburg (State Suburb)". 2016 Census QuickStats. Retrieved 2017-07-03. ^ Dreyfus, Kay. "Australian dictionary of Biography". ^ Edwards, Peter. "Australian Dictionary of Bibliography". Wikivoyage has a travel guide for Brunswick and Coburg.